I think I’ve wanted to visit the Blue Lagoon for longer than I’ve actually wanted to go to Iceland, not that that really makes any sense. But it was certainly my number one thing to do while in the country for a mere 24 hours last December. 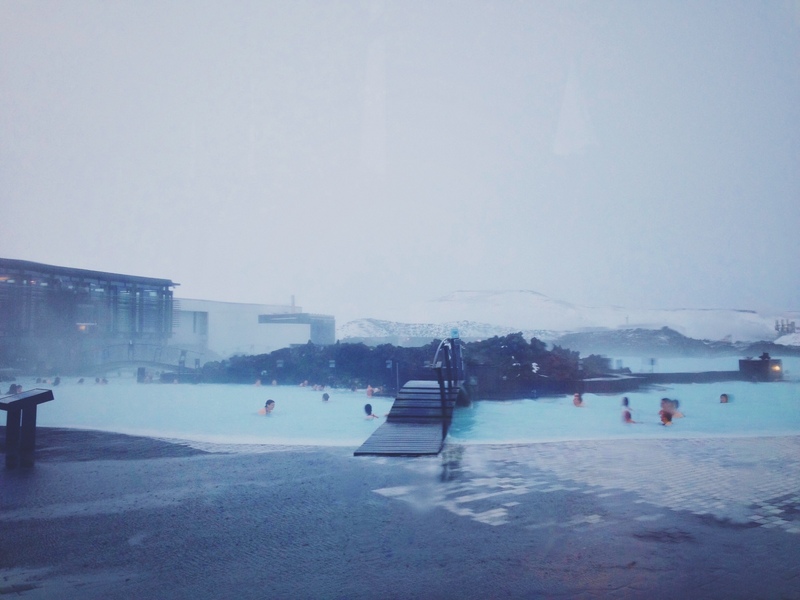 When researching about the Blue Lagoon before booking our visit I found plenty of helpful blogs about how to look after your hair and if you should pay the extra for the premier packages but I found very little about visiting in the winter except that it would be open. I was concerned about the temperature and if our visit would still be worth it on a bad weather day, after all every picture you see is on a sunny day. I hadn’t even thought about the daylight hours Iceland would be receiving in December. It was mid winter when we visited and Iceland gets a mere four hours of daylight during this time. This meant with only 24 hours in the county, my only hours of daylight would be spent at the Blue Lagoon. This was a win in some ways but I couldn’t help being a little disappointed about the fact we would not see Reykjavik in daylight. We booked our Blue Lagoon trip through Reykjavik Excursions as this included transport from our hostel to the lagoon and then on to the airport. The bus picked us up on time from just outside the hostel at 8.30am, it was still dark outside and the whole city seemed to still be sleeping. We took the mini bus off to the main terminal and then changed on to a coach for the trip out to the lagoon. It took around 40 minutes to get there driving through the dark landscape of Iceland. As we drew closer the snow began to worsen and the wind howled. As excited as I was by the time we arrived I wasn’t so keen on getting off the coach. When we eventually reached the reception we were dripping wet and freezing cold. The queue to get in was a little long due to a whole coach load heading through together. However, the friendly staff handled this well by talking us through some essential information while we queued. Once we were through and had a wristband in our possession we were free to enjoy ourselves. The changing rooms were split in to male and female and were a very classy affair. The lockers were activated by said wristbands and were of a good size for people travelling with hand luggage. 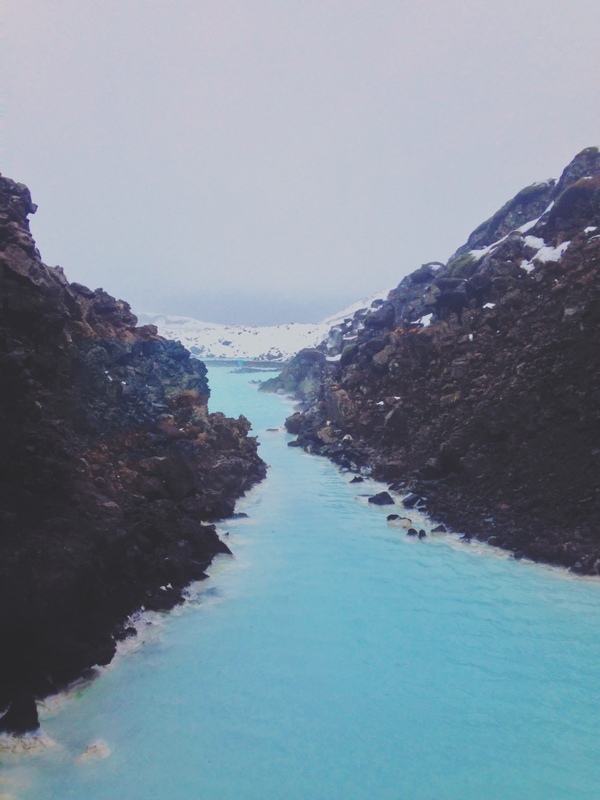 You will need to shower before entering the blue lagoon to rid your body of all dirt including the deodorant you put on that morning – it is bad for the water. From the changing room you walk straight in to an area for towels and the lagoon entrance is to the left and cafe to the right. You can also enter the Blue Lagoon by going straight outside – to begin with I thought this was the only entrance and ran outside in the freezing cold to jump in the water. After that I learnt my lesson and used the pool entrance that connects outside through a door in the water. For the first hour of our visit we were in darkness (we arrived at 10am), slowly daylight began to creep in and enabled us to see more than just the lagoon. The weather however got worse as the day went on and despite promising myself I would not get my hair wet I frequently needed to tip my head back and warm my ears from the bitter wind. Parts of the lagoon were warmer than others and getting in one of these hot pockets allowed me to keep warm for a while. However I was still glad I was wearing a rash vest. We alternated between being outside and in, took showers when we felt too cold to be outside and spend much longer than you are meant to in the sauna. 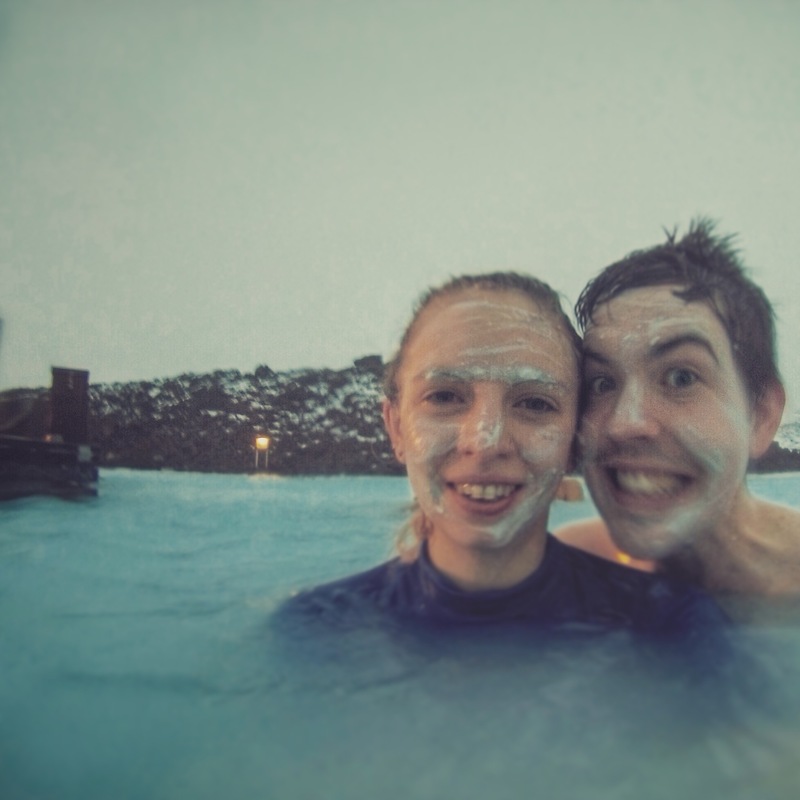 The cold didn’t ruin our time in the Blue Lagoon it did, however, shorten the amount of time we spent in the water. As after an hour and half I was just too cold to enjoy myself any more. You will only experience daylight from 11-3 approx. So plan to go between this time if you want to get a decent photo opportunity. Beware of the bitter wind that comes with bad weather it will burn your ears – I would highly recommend taking a hat you can wear in the lagoon/can get wet, it might not be fashionable but you will appreciate it. You don’t need to hire a dressing gown to keep you warm out of the water, as the entrance to the lagoon is inside. If you are feeling too cold head in to the sauna or inside for a hot shower, you’ll be good to go for another half an hour then. You will not be able to get decent photos if the weather is bad, while we were there the snow was always blowing and within 30 seconds you were soaked, I didn’t want to risk the same thing happening to my expensive camera. You will need a Go Pro (or water proof camera) to attempt any kind of photo in the wet and snowy weather. The lagoon was not packed with people during the whole time we were there but it was especially quiet earlier on, I have heard very different things about the summer. Guard your wrist band with your life, if you lose it you have to pay for it and I found they aren’t that secure around your wrist. Cover your hair with leave in conditioner before entering and tie it up away from the water if possible, they also have conditioner for using afterwards which is full of the right stuff for helping to fix your hair. I didn’t find the effects too bad for my hair. Buy the standard package, it does the job and you can easily bring a towel yourself and they have face mask available – if not everything is available for hire. We also bought a drink in the water however they were rather small and extremely cold on the hands. I’d just wait until you hit the cafe afterwards. The Blue Lagoon is located around 40 minutes from Reykjavik and 20 minutes from Keflavik airport. While in the Blue Lagoon everything is operated with and paid for using the wristband, this way you don’t need to worry about carrying cash near the water. Just be careful to keep a close guard of it as there is a fine for losing it. They have luggage storage for €3 per an item although if you are travelling with carryon baggage only, this will probably fit in the locker inside. We booked our trip with Reykjavik Excursions with standard entry and transport for 8.900isk (£45), pick up was 30 minutes before departure time. Then checkout this video about my whole 24 hours in the country! Hi! I was wondering when in December you went? I was thinking of going during new years but now am thinking of late November from what I read. Do you think this will make a big difference in terms of the cold and the wind that the weather can bring? We went just a few days before Christmas. In terms of the daylight, any time between Nov and Feb is going to be bad for light. As far as the weather goes any winter month will be cold with the possibility of wind – I think it would be luck if you missed the weather all together even arriving in November. I am not 100% sure on this so best to check the FAQ on the Blue Lagoon website. I stayed at the Loft Hostel and flights were booked with Icelandair. Hope that helps! Hi Libby, The lagoon is shallow enough to stand in most places so you should be okay. I’m going in December, so excited! Did you get to see the northern lights? As for the lagoon, it is basically like going to a swimming pool. You get changed in the changing area and bring your towel through to the pool. There are plenty of spaces to hang them up here and then you can get straight in the water and see the little tunnel to get outside. No need to go outside to get in the water. To get to the sauna you have to swim so you won’t need a towel for this and of course the honest place to be is the water. I only remember one area where you could sit down and relax and would possibly want a robe but I always found a towel sufficient. We pretty much spent our whole time there in the water or in the sauna. No shoes needed 🙂 Hope this helps. Jodie!!! thank you so much for this it was exactly what i needed. I’m going to Iceland in December as well and i felt a little lost as to what to expect at the blue lagoon. Should we stay in downtown Reykjavik? Where is the best location to book a hotel? we are going for 4 days around christmas time. Any other suggestions? Hi Lisa, I’m glad I could help you! Iceland will be amazing around Christmas time. I would love to go back again so much. Yes I would suggest downtown Reykjavik, we stayed at the Loft hostel in a private room and it really didn’t feel like a hostel. There was also Kex hostel which has a similar luxury hostel vibe. I’m sure there are plenty of hotels around this area too. Hope that helps you. Thank you for this! Really good! May can you help me with a question…. I book my visit for 9 o clock in the morning, do you know how many time can I stay in the lagoon after arrive? I was wondering if you could wear regular swimsuit at the blue lagoon. We are going in January and I was thinking of booking a tour which includes transfers on January 28, 2017. How many hours of daylight by this time of the year? I don’t know how to swim so I could I still enjoy the blue lagoon? Hi Teresa, In January I think the day light is around 10-4 but I could be slightly wrong – might be worth a google! You can definitely wear a normal bathing suit, I don’t no problem with mine although wore a rash vest to help keep warm. I feel the cold a lot. As for not swimming that is no problem, you can touch the bottom around the whole lagoon and plenty to do except swim. I hope you have a fab time! Super useful information, thank you! I’m going in 3 weeks! I think I’ll aim to go around 2pm and try and stay for sunset (weather permitting). Where did you keep your camera when you weren’t taking pictures? Did you have to run back to your locker to place things in it? Thanks for the info we will be there next week… do you recommend water shoes or water sandals?? We are set for an afternoon visit..part of a package. I imagine you need to shower and dress to use use eating areas. I will be getting a sleeved shirt for the day…suppose to snow the day we are there. Seems like you had a fun trip! Thank you for sharing your experience. I was wondering what date or when exactly in December did you visit the Lagoon? Since I plan to visit the Lagoon around the last week of December during the holidays, I absolutely understand that I cannot avoid the crowd, but hopefully I can at least aim to visit the Lagoon with less people around. Also, since you were there from 10-4, what did you think was the peak hour? Would two hours before closing be the best time to visit the Lagoon to avoid the crowd? Hi Janine, I visited around the 20th of December so also peek holiday time. I would say it was most empty at opening time as most people didn’t arrive until an hour or two after opening. It was also nice being some of the first people in the lagoon. I hope you have a good trip!